An aerial view of the Delaware Municipal Airport. The Delaware Airport Commission approved some fee increases at its meeting Thursday night for City Council consideration. Staff want the increases before the city finalizes a draft of its strategic business plan at the Delaware Municipal Airport, 1075 Pittsburgh Dr. If approved, the city would increase the ramp fees for the first night for certain types of aircraft. The ramp fee for jet engine planes would increase to $100 from $75 for the first night and to $50 from $40 for additional nights. The same fee for turbo prop planes would increase to $40 from $30 for the first night and to $30 from $20 for additional nights. The first-night fee is waived if pilots of turbo prop planes purchase at least 100 gallons of fuel. Pilots of jet engine planes would have to purchase 200 gallons. “We rather have them purchase the fuel,” said Kevin Piatt, airport operations supervisor. In addition, the call back or call in fees for service after normal working hours would increase to $80 from $70 for the first hour and to $60 from $50 for additional hours. The fees help offset the city’s overtime cost, Piatt said. The last update to the fees was in 2012, he said. The airport serviced 365 jets last year. • Discussed providing Wi-Fi at hangars. Some tenants are interested. Commission member said cost was the main concern and more information was needed. 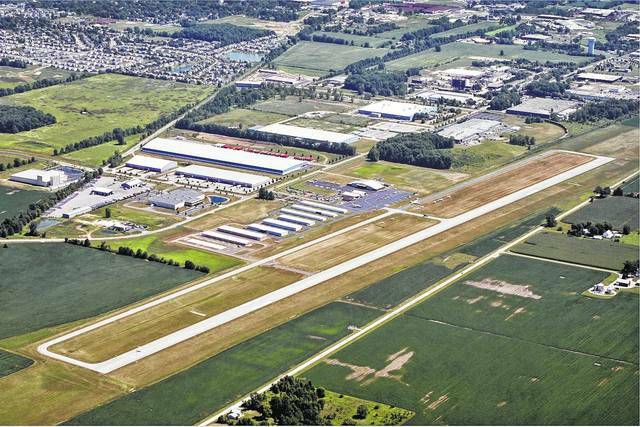 • Were informed that the Ohio National Guard will use part of the airport as its base of operations for a training exercise at Alum Creek Lake from July 25-27. The exercise could last from 8 a.m. to midnight, Piatt said. https://www.delgazette.com/wp-content/uploads/sites/40/2017/07/web1_Airport-aerial-1-a.jpgAn aerial view of the Delaware Municipal Airport.